ZOONDIA Established in 2008, Zoondia came about in order to fill a gap in the mobile, cloud and web applications market. 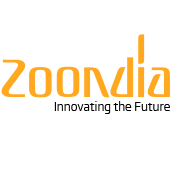 Created to supply the demand for affordable and efficient development outsourcing solutions, Zoondia came about as a result of the pooling together of the top technological development talents of India. We have a large operations facility in Technopark, Trivandrum Kerala India but we also maintain offices in several parts of the US and Middle East. We take pride in our team of highly trained, committed, and talented professionals who come from a diverse set of backgrounds such as Open Source technologies computing and Java programming. Zoondia is a leading provider of technology solutions and custom software development, one who is dedicated to the development of customized, creative and affordable solutions that can meet the needs of our expanding clients. Through leveraging of our skills in the most advanced information technology, we are able to assist our clients in boosting productivity, efficiency and workflow. We consider ourselves as experts and innovators in the fields of mobile applications technology, cloud application development, custom software development, Web design architecture, Business Catalyst Development, Internet/Intranet application development, SEO building, e-Commerce, and graphic design. Our commitment to offering an exceptional experience to our clients is unmatched, delivered through a means of education and personal attention to detail. Our goal is to help our clients to enjoy the technology they use, and reap the benefits it can provide for their businesses’ profits and productivity. This level of commitment makes the Zoondia experience truly unique. These days, all too often we see IT companies offering solutions but nothing that goes beyond this basic service. Companies like these fix your software before moving on without carrying out a thorough analysis and understanding of what your company’s IT needs are. Here at Zoondia, we do things the right way. We take the time to get to know what it is you want, through understanding your business and the way it operates. This, together with our commitment to seeing your business thrive, is what sets us apart from the competition.